Calculating the probability under a normal curve is useful for engineers. This type of calculation can be helpful to predict the likely hood of a part coming off an assembly line being within a given specification. The probability can be calculated when the statistical properties of all the parts that have come of the assembly line are known. At a facility that manufactures electrical resistors, a statistical sample of 1-kΩ resistors is pulled from the production line. The resistor's resistances are measured and recorded. A mean resistance of 979.8 kΩ and a standard deviation of 73.10 kΩ represents the sample of resistors. The desired resistance tolerance for the 1-kΩ resistors is ± 10%. This tolerance range means the acceptable range of resistance is 900 Ω to 1100 Ω. Assuming a normal distribution, determine the probability that a resistor coming off the production line will be within spec (in the range of 900 Ω to 1100 Ω). Import the necessary functions. We need to use the erf() and sqrt() functions in Python's math module. Define the constants for this problem. The mean, standard deviation, lower bound and upper bound will be defined. Calculate the probability using the erf() function from Python's math() module. 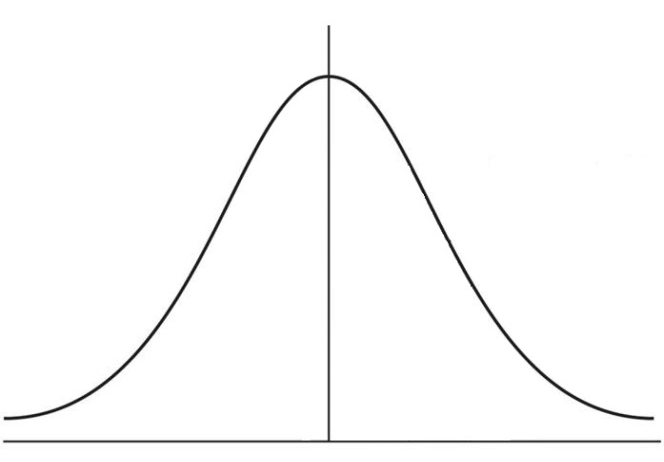 Let's take a look at a Gaussian curve. The shape of the curve describes the spread of resistors coming off the production line. We need to find the area under the curve within our upper and lower bounds to solve the problem. Open up a new Python script called stats.py. In the first line of code, we import the erf and sqrt() functions from the math module. Because the math module is part of the Python Standard Library, math does not need to be installed using conda or pip. Now we need to define the constants. The mean is 978.8 kΩ, and the standard deviation is 73.1 kΩ. The acceptable range of resistance is between 900 kΩ and 1100 kΩ. These two values, 900 kΩ, and 1100 kΩ define our upper and lower bounds. Next, we calculate the Z-transform of the upper and lower bounds using the mean and standard deviation. Then we use the erf() function to calculate the probability from Z = 0 to the Z-transform derived from the upper and lower bounds. From the Z-transform of the upper and lower limits, we calculated two probabilities: p_lower and p_upper. We can use these probabilities to calculate the likelihood a resistor randomly pulled off the line is within tolerance (inside the range of 900 kΩ to 1100 kΩ) or out of tolerance (outside the range of 900 kΩ to 1100 kΩ). Determine the probability that a resistor coming off the production line will be within spec. In the next post, we will use Python and Matplotlib to build a curve that describes the problem.